The Huawei MediaPad T1 7.0 mobile can both be used as mobile and as tablet. This mobile/tab is a recently launched range by Huawei. This is very sleek and stylish looking phone with a long battery life. The phone is thin; so easy to hold and easy to carry. The model supports FM radio and various audio/video files. This table also comes with a light sensor. The Huawei MediaPad comes in a silver colour with black panel. The model comes with a WSVGA screen that gives a clear image. The model is very lite; it has a thickness of 8.5 mm. The model has a weight of 278 g. The tablet has a dimension of 191.0 x 107 x 8.5 mm. 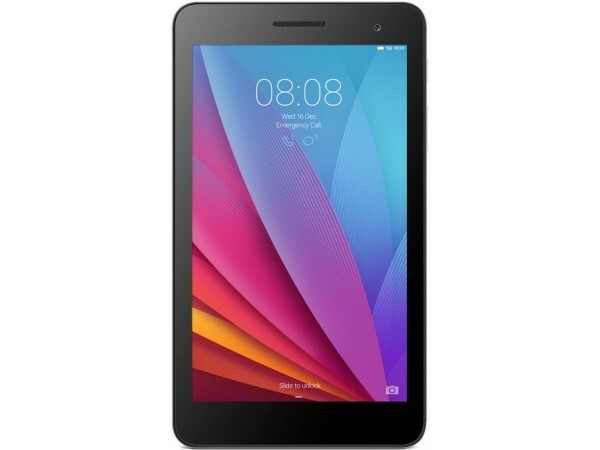 Huawei MediaPad T1 model has a high speed internet connection that makes browsing and downloading fast. Model has a high back-up battery with 4100mAh Li-lon battery. The battery gives a back-up of 300 h stand-by and 10 h talk-time (multi-media). You can browse for about 8 hour and watch movies up to 12 hour without repeatedly charging the handset. The Huawei MediaPad T1 has a huge display. The model comes with a capacitive display screen of 7 inches wide. The screen in ONCELL touch-sensitive screen. The model has a display resolution of 600 x 1024 pixels with 16M display colours. The Huawei MediaPad T1 has both rear and front camera. The rear camera is Dual 2.0 mega pixel in size with a resolution of 1600 x 1200 pixels. The front camera is 2 mega pixels. Both the cameras have auto focus and digital zoom. This camera can also be used for video recording also. Processor and Operating : This Huawei MediaPad has a 1.2GHz quad-core Spreadtrum SC7731G processor. The operating frequency is quad-band GSM 850/900/1800/1900 MHz and the Operating System used here is an Android OS, version 4.4 Kit-Kat. The Huawei MediaPad T1 has a huge storage space. The internal storage capacity of this model is 8GB and a 1GB RAM. The Huawei Y635 has connectivity options like GPS, Wi-Fi, micro USB 2.0, Bluetooth 4.0 with BLE and GPS.